Perry’s office has not indicated how exactly the governor will decide on the issue, but if he signs the bipartisan bill into law, homeowners associations would be forbidden from prohibiting the display of a mezuzah – the box-encased scroll of parchment affixed to doorposts in keeping with a positive commandment mentioned twice in the Book of Deuteronomy – or other religious item. First drafted in 2009 as H.B. 3025, H.B. 1278 comes in response to the case of a Houston husband and wife who in 2007 were asked to remove their mezuzah from their apartment’s entryway or face fines. The condominium association claimed the display was against regulations. They brought suit, and after a failed hearing in a U.S. District Court, their lawyer contacted their state representative, Garnet Coleman. 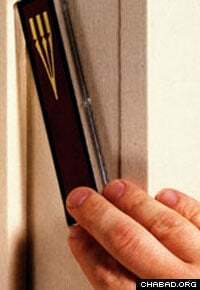 While the word “mezuzah” is not mentioned in the bill’s text, it allows for one or more religious items of no more than 25 square inches – large enough for a typical mezuzah – to be displayed on the entry door or doorframe. “I filed this bill to extend religious freedom in situations where it may not exist,” explained Coleman. State Sen. Kel Seliger, who sponsored the bill, said his choice to get involved was a simple one. The concept of a mezuzah is mentioned twice in the Book of Deuteronomy. State Reps. Scott Hochberg and Debbie Riddle joined Coleman in authoring the current bill. It passed both the State House of Representatives and the Senate and is now waiting to be reviewed by the governor. Similar legislation became law in Illinois and Florida in 2007 and 2008 respectively. Coleman was optimistic his bill would likewise be signed into law.